Woot!! 100 weeks of Friday Favorite Finds. So, I started posting these recipe finds here. On Fridays. And, you started commenting. Out of that grew the interest in having a linky so that you all can share your recipes to try too! The face of Friday Favorite Finds has changed a bit over the years…. But, I find myself always looking forward to Fridays! Thank you so much for making this linky a part of your week. I know there is so much going on in all our lives and in all of blogland – so it is extra special for me that you come back here week after week and participate and visit one another’s links. You are all wonderful. As a “THANK YOU” to you, I am going to give away an Amazon Gift Card to one of our regular participants here. After the linky closes this week, I’ll choose one of you to receive the $25 Amazon Gift Card. The only criteria – you have to have linked up to at least one prior Friday Favorite Finds. 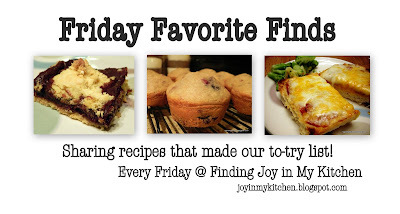 For this week, I went back through my old Friday Favorite Finds Posts, pinned some oldies and want to share with you some of the recipes I’ve found… that I still haven’t made….but I was pleasantly surprised by the number of finds I actually have made! f you were featured, feel free to grab the button below! Please link up to a post containing your list of recipes to try -- do not link up individual recipes please, save those for other linkys. Your links will be deleted if they are for individual recipes. Be sure to leave a link back here to Finding Joy in My Kitchen. Happy 100th! I always love reading your blog and recipes. Thanks for creating the link party. It's a great way to share all of the great ideas out there. Happy 100 posts! I have enjoyed reading each week. Congrats on 100 weeks of Finds! It all looks so good! Hope you have a great St. Patrick's Day week end and thanks for hosting! Those pineapple-bacon bites looks delicious! And congrats on your 100th week of FFF! Even when I don't have a chance to link up, I always enjoy checking out what everyone found. Hi, Sno. Thanks so much for hosting this each week. I know, hosting a linky party definitely grows into love for the bloggers who link regularly. I feel that way about my Must Try Monday linky. So much fun! Congrats on #100! Congrats on a successful 100th F.F.F. Post! Your blog is one ofvthe first that inspired me to feed my family more whole, healthy (and delicious!) foods. Thanks so much ... And enjoy this 80 degree weekend Minnesota winter! Happy 100th FFF post! :) I am off to check out that rotini recipe - yum!! 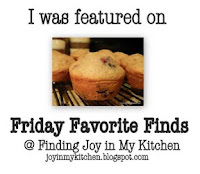 100 Favorite Friday Finds, what a great resource. I know that I check by own Friday Finds regularly to check out what I had come across that I wanted to make. I need to check out the links back from the beginning. I'll bet there is some good stuff there that I have missed. Thanks so much for hosting each week. This is always such fun. Happy 100 Favorite Finds! I love linking up to this weekly feature! May you have a wonderful weekend! Wow..Happy 100th FFF post!! Im glad to find you here in bloglang.Thanks for hosting and sharing too.Hope to be here in every post!Happy Weekend to everyone. Congrats on your 100th FFF! I know I always find some (or a lot :P) of tasty eats here!